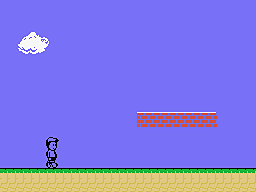 ColecoVision.dk Homebrew Section Presents: Robert. Robert is that person who has implemented programming of Frog Feast for our ColecoVision. The game itself is derived from other related games. Frog Feast was out for Atari Jaguar, a fine CD version from Charles at Rastersoft. Also for Amiga CD 32, Sega Dreamcast and least 8 more systems. Robert has his permission from the developer Rastorsoft to create a version for ColecoVision. Open source, so no problem at all. Robert will try to make the game deeper, and maybe add more levels. If he finish the game, he will give AtariAge his license, and leaving them for the release of the game. If AtariAge not will help him, he will instead deliver the game back to Rastorsoft. And then it's up to Charles if he will publish it in a cartridge. Robert has until now made 2 versions of the Frog Feast. An Open Source and a Commercial one. Another game Robert worked on, was the scrolling game Jack B Quick!. 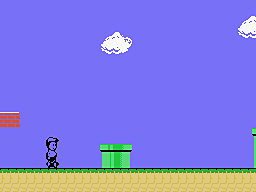 Jack B Quick is a kind of Super Mario Brothers, Robert did only make this little demo. It was an incredibly beautiful piece of code, and could be used in SMB for our ColecoVision. Jack B Quick! 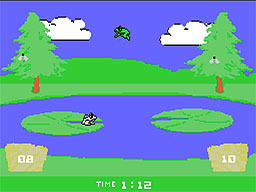 a side Scrolling game. He also work on another great game "Pacific Fleet". Early Pacific Fleet for ColecoVision. An Submarine, maybe for title screen. Newer graphic for the game. The game may seem like the good old Battleship, in that you place 4 ships, and so does the 2nd player, or the computer in 1 player mode. It is a real time strategy game, with several different missions, land that gets in the way, time element aso. You have 5 points to purchase your armada. 1 point buys you a Patrol boat. 2 point is the cost of a Sub. 3 points for a Battleship. and 4 points for an Aircraft carrier. The Open Source version is free to Download. You can, therefore, have a 5 "PT boat" navy if you want. Or 1 sub and 1 battleship navy. etc... whatever you want with your 5 points. The Patrol boat, takes 2 squares, and sinks with 1 hit. The Sub takes 2 squares and sinks with 2 hits. Battleship 3 squares and sinks with 3 hits. Aircraft carrier, 4 squares and 4 hits to sink. Patrol boat, can only fire a precision Mortar round i.e. the classic 1 square shot of Battleship, the Sub can only fire a Torpedo. The Battleship can fire precision Mortar round or launch a Sonar (reveal 9 squares at once). The Aircraft carrier can fire precision Mortar round or launch a Carpet bombing strike. (Hit 9 squares at once, that are roughly in the area you asked, but its also partly random). Finally, each mission takes differing amounts of times. The Sub cannot rapid fire Torpedos, after firing one. Torpedo's are not available again for 30 seconds etc. If you lose a ship, you lose its capabilities too. And so on, and tweaking to make sure everything is playable, feels like strategy and fun. The games Frog Feast and Pacific Fleet seems like really funny games, just too bad they never hit the market. Maybe another programmer could fix the last coding for those games. 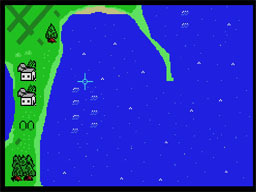 Robert has not yet (July 2008) completed the commercial version of Frog Feast. There is nor anything new about the Pacific Fleet game, he started in 2007. To get in touch with Robert, try via: AtariAge.